Who will be the mobile operator of the year at EGR Operator Awards 2011? It is important to design for many different scenarios when designing for the mobile. For instance we know location, time and can build a greater player experience based on this. It is also of great importance to understand the context of use and think about the complete player experience and design for. When and where do players play? What devices are they using? 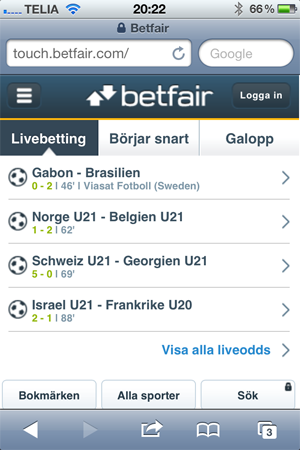 Betfair’s solution is very straight forward and very much around what is happening now or in the near future. This is a great way to prioritize the information you display on your website. 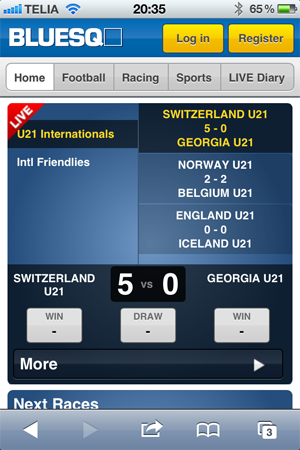 Blue Square is very similar to Betfair with live games on the start page. It do not show which sport it is though which might not be completely obvious at times. 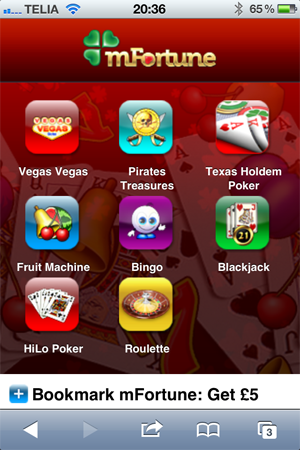 mFortune is the online mobile casino on the shortlist and it is has copied the apps on the iPhone solution for displaying games. Works well but not very exciting. 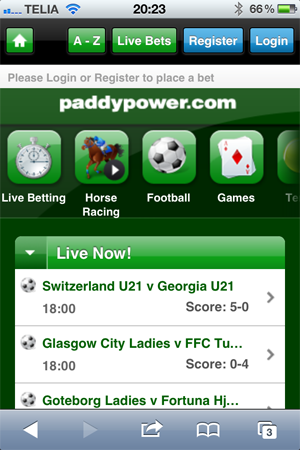 PaddyPower’s site is very straight forward with no surprises with live betting at the start page. 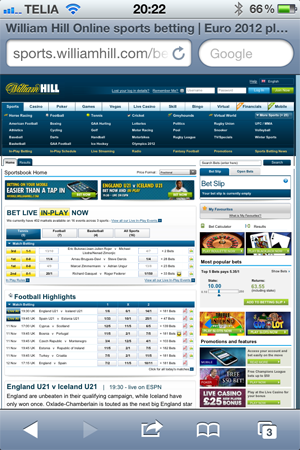 William Hill (link asked to be removed by William Hill) do have a mobile version of the website, but when you go to williamhill.com using the iPhone then you come to their regular site. This is not a very good implementation, instead they should automatically be redirected to the mobile version. I will be very surprised if William Hill (link asked to be removed by William Hill) wins the award when they have this solution. My favorites to win the award are Betfair, Blue Square or PaddyPower. Can’t wait for the awards to see who wins and the motivation for winning. Ps. Want to discuss mobile gaming at ICE Totally Gaming in January? I will hopefully be there for a day or two. Just send me an e-mail and we’ll set up a meeting. Ds.